Wakeskater Studio Indie Game Development: [SBX:I] Level 3 is done! Version 0.007 is available for download! [SBX:I] Level 3 is done! Version 0.007 is available for download! So what have I added this update? Well, lots. Most of it you won't see though (unless you figure out how to use cheat codes and go to the test level). And if you want to know how to do that, subscribe to my blog and I'll tell you how to go to the test level which has all structures unlocked. 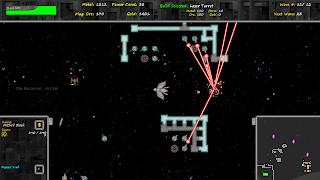 You can now upgrade Gun Turrets to Sniper Turrets in Level 3. Expanded Generators were removed from initial structures and now upgrade from a Basic Gen. The Expanded Generator Build slot has been replaced with Long Generators which increase tower range. Sniper Turrets have advanced targeting with movement prediction. Level 3 now has a (pretty damn hard) Boss! He will plow through your turrets and walls and wreck havoc to your fortress! Expect to see him intermittently in later levels at various power levels. You can now use the [U]pgrade button to repair walls when they are selected. This is more cost effective than replacing them. Increased timer at the beginning of the levels. Better Tutorial, explains each step slower and walks new players through placing generators and turrets. You can now place blocks when there is a weapon graphic beneath it. Reduced Mining Research Gold Costs. Updated F1 Game Information to have accurate control information. 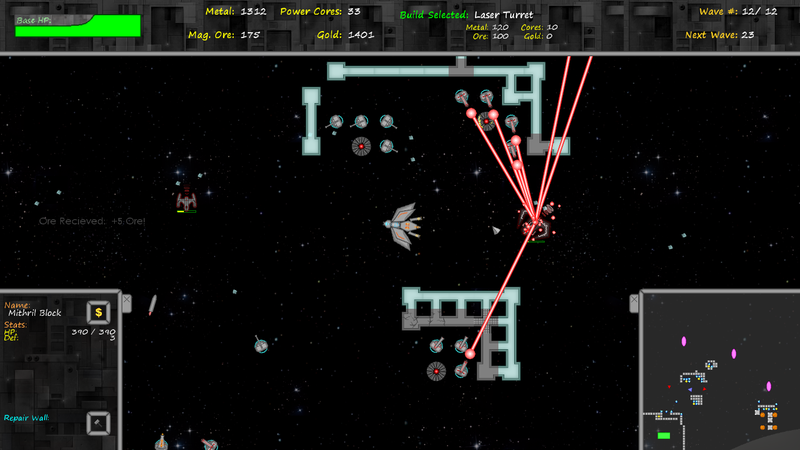 I think the thing that surprisingly took me a while was figuring out the advanced targeting on the Sniper Turrets. I was really tired, but once I figured it out, it was fairly simple. In the next few updates I'm planning on adding in the rest of the weapons, buildings, generators and walls that will be in the game and you will gradually unlock them as you progress. Also some things on my to do list are: Saving/Loading, Level Selection, Escape Menu with Options, Pause Button (Separate from Escape), and a Structure Build Panel to select structures from and place with just the mouse. Download the file at the top of the post and subscribe to the blog for special perks, bonuses and more!